As anyone reading other blogs on this site regarding my travels will perhaps know. One of my favourite pastimes is to identify quirky, interesting and diverse stories from the North American media. Yet another story or two came to my attention in the past few days concerning that venerable Canadian institution – the Zamboni. Canada ’08: Hockey Refs eh! I tend to go easy on officials in any of the sports I watch. I’m not one for thinking that the referee has some sort of mysterious vendetta against my favourites and will never give a decision their way come what may. It’s an unenviable job being a referee or a linesman in my view – I try to cut them a little slack. Sometimes it can only be observed though that the official(s) are having a bit of an off-night. I recall one infamous occasion then an American referee and his linesmen officiating at a Nottingham Panthers game had such a woeful performance that prior to the following week’s game, the Lower Parliament Street organist played Three Blind Mice as the stripeys skated out to start the game. Dear old Eric on the organ was duly knuckle rapped for that piece of fun I believe but the officials in question took it all in fun by posing in their uniforms, complete with false mouse whiskers for the next edition of the Ice Hockey News Review publication. Here’s a recent smile that came my way anyway. I love this sign, it’s so lovingly created and passionate in it’s detail. 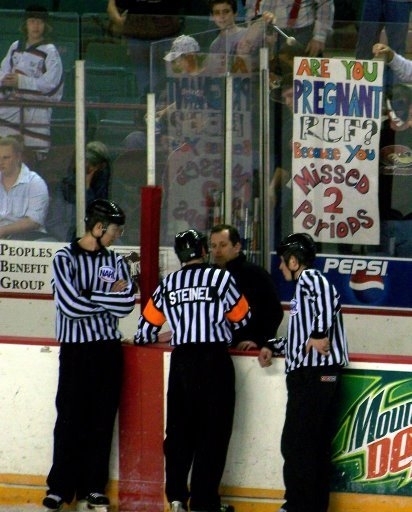 Hockey refs – we love you really.